I don't need 5 years to get inflated - I could do that in a snap. I keep saying summer is brutal because of all the bbqs but then I would say the same thing in winter - "can't go out and walk, it's cold", thanksgiving and other holidays and a slew of other excuses. But if we fall, we can always start over again. Just visualize yourself to the ideal weight you want to be in. I need to do the same. it won't take you five years pat to have the weight you want. take it slow, but right. actually i gained most of it when i got pregnant. i probably added only 10 lbs in the last 4 years. 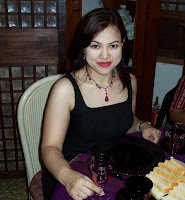 i do hope i can go back to my 2003 weight in a few months. that time, i did the atkins diet. if my healthy plan doesn't work, i just might try atkins again.